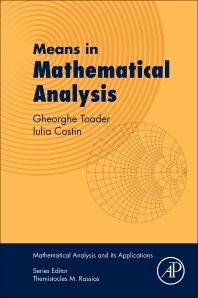 Means in Mathematical Analysis addresses developments in global analysis, non-linear analysis, and the many problems of associated fields, including dynamical systems, ergodic theory, combinatorics, differential equations, approximation theory, analytic inequalities, functional equations and probability theory. The series comprises highly specialized research monographs written by eminent scientists, handbooks and selected multi-contributor reference works (edited volumes), bringing together an extensive body of information. It deals with the fundamental interplay of nonlinear analysis with other headline domains, particularly geometry and analytic number theory, within the mathematical sciences. Gheorghe Toader was born in Romania in 1945, but deferred research until 1980 when he defended his PhD thesis, and served as Professor at the Department of Mathematics of the Technical University of Cluj-Napoca until retirement. From 1970 he has been a referee of Zentralblatt fur Mathematik and since 2007 was in the Editorial Board of Journal of Mathematical Inequalities. He published more than 70 papers related to the subject of this book. Toader sadly passed away in early 2016. Iulia Costin was born in Romania in 1971. She graduated in 1994 from the Faculty of Mathematics and Informatics at "Babes-Bolyai" University in Cluj-Napoca. She defended in 2001 her PhD thesis with the title "The usage of symbolic calculus in the study of means and double sequences", in the same field as this book. Currently she is a Senior Lecturer at the Computer Science Department of Technical University of Cluj-Napoca. She has published more than 30 papers related to the subject of this book.